Cut-off date for age calculation is 01.08.2018. Age relaxation is applicable as per Government of Tamilnadu rules and regulations. Teaching Jobs : Maximum age limit is 57 years for all candidates. Additional 10 years relaxations are applicable along-with the above communal category for Persons with Disabilities (PwD) candidates. P.T. Lee Chengalvaraya polytechnic college is Tamil Nadu Government Aided Institution. 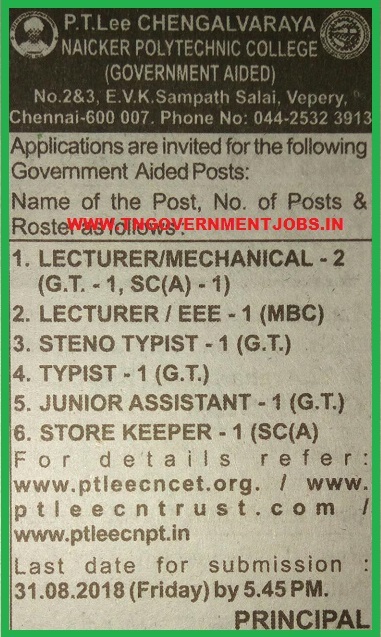 The above posts are regular category / permanent job. There is no application registration fee for P.T.Lee Chengalavaraya Polytechnic College Teaching and Non Teaching Vacancy Employment Process 2018. 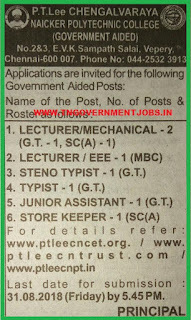 How to apply for PTLee Chengalvaraya Polytechnic College Vacancy Post 2018 Recruitment? Application envelope must be superscribed with "Post applied for ....."
Interested and eligible candidates are requested to apply with detailed application form, along-with all supported documents, duly self-attested to the following address on or before the last date. i.e. 31st August 2018. I am R.Santhana Krishnan beg to request you to kindly send me an application for the post of Jr.Asst. and Typist to the mail id:adpl@gmail.com I am eligible for both the posts. we sent your above mail, but it has bounced-back. I need application form for junior assistant. Dear Sir!I need application format for the post of Junior assistant.. please Send by mail. I NEED A APPLICATION FORM SIR. kindly send me my maid id sir. Dear friends, application forms already sent to your email id. please check. Or you can directly download it from this page. Application Form updated for download. evvalu amount irundha apply pannalam bass? eppadi koduppathu bass? I am also having the above same doubt. If you don't mind, please clarify. If no one is ready to pay for post... then what will happens? Hi fraud, what nothing has come out? Everything is over giving advertisement for formality. Yes boss. The fraud seems to be made all appointments by fraudulent method. No intimation was sent. The advertisement was issued only for formality. Anybody received any intimation? Please inform.